"That's a nice watch, not like those ugly fitness trackers you normally wear," said a friend, as we sat down to dinner while I had the Nevo Watch strapped on. Little did she know that the Nevo is another Swiss movement packing analogue watch (although it's made in China), with a payload of hidden smart tech features, the likes we've seen from in the Withings Activité and Mondaine Helvetica No.1 Smart. In some ways, the Nevo is smarter than either of those two devices. With fitness tracking smarts built-in, the Nevo will also alert you to smartphone notifications, which in some ways helps it challenge the likes of the Apple Watch and Android Wear devices for fashion conscious buyers. But does it match up? And is the rather pricey $299 price-tag justified? We put it through its paces to find out. The plain analogue watch face is free from numbers, dates and even branding, and makes for a wonderfully minimalist look that's classy and expensive looking. The brand's logo is just visible on closer inspection, yet the simplicity is bang on trend. The watch itself has a slim metal case that houses the Swiss movement. The case bulges underneath to house the accelerometer, sensors and Bluetooth chips, yet is cleverly hidden from view as it sits upon the wrist. There are three physical buttons, the top which shows your progress towards your step goal by lighting LEDs hidden at the hour notches, which use the 12 positions to offer a visual representation of the percentage hit. The middle is a traditional crown, and you pull it out to manually adjust the hands. It's wonderfully simple, and means you don't have to frustratingly pair the watch to adjust the time. The bottom button is used for Bluetooth pairing – which unfortunately is a regular occurrence as you try to reforge a connection between the Nevo and your smartphone. In terms of features, the Nevo does three things: it monitors your daily steps, it notifies you of activity on your smartphone, and very importantly, tells you the time and can be used as an alarm. As a fitness tracker, the Nevo is extremely basic. While the website promises running, swimming and sleep tracking, there are currently no provisions for these features in the current version of the app – so anyone hung up on those features will have to trust they'll arrive at some point. You can set three levels of activity goal (light, moderate and intensive) and it monitors your progress on your way to these numbers. You can fine tune these levels to any number of daily steps just by tapping the edit button. While on the whole, steps were inline with the Jawbone UP2 we tested against, the app is one of the most basic we've ever used. You can only see how many steps you've taken on a given day, so there's no analysis of your weekly or monthly performance, and there are no graphs or charts to look at. For many this simplicity might be attractive. Nevo informs you of your daily steps and offers awareness of how sedate you've been – but alternative trackers offer so much more. The Nevo watch also takes a simple approach to notifying you of messages, social alerts and emails. When something happens on your smartphone – a call, SMS, email, Facebook, calendar or WeChat – the Nevo vibrates and shows a coloured LED, which again is placed around the watch face. There's no reading or previews available – the Nevo has no screen – but you can customize the colour of different alerts from within the app. You can also turn the notification types off and on, so you can only be alerted to calls and SMS, while ignoring less important Facebook messages, for example. It's a decent system for those who want to be more connected to important messages. The Nevo tended to buzz with any notification on our smartphone, so third party apps not listed above are catered for, but in the fortnight we spent testing, we never really got to grips with picking between notification types. Less is certainly more, which is a mantra that's regularly repeated across the Nevo. While tech specs on the Nevo are minimal – one impressive stat is its battery life. Using a swappable watch battery, the Nevo will last six months between changes for smart features – yet cleverly, there's a second battery, which keeps that Swiss movement powered – offering 5 years of timekeeping. This trumps the Withings, which is all powered from a single battery, and means that on the day the smart features die, the watch is still usable until you get round to swapping out the battery. 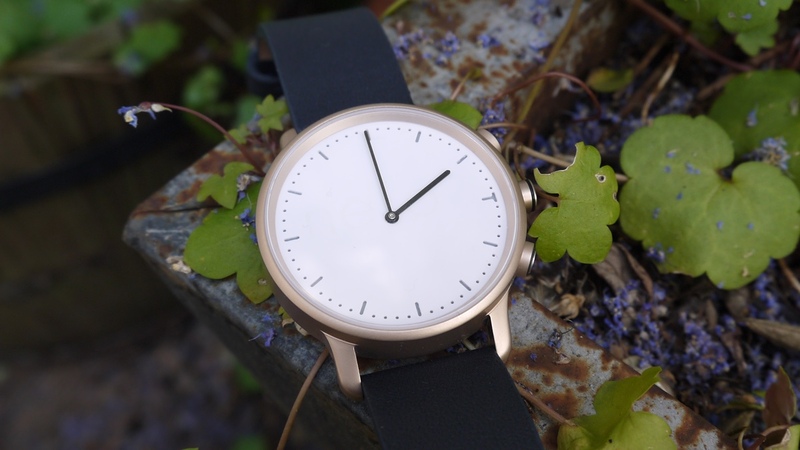 The Nevo is a great looking watch which is a pleasure to wear, and oozes genuine style. It's a watch first and a wearable second. For those looking to get an overview of their daily activity and basic smart features, it does just enough. However, with obvious features missing, we enjoyed using the more feature rich Mondaine and Withings Activité a lot more.